Every parent wants to keep their child safe from harm, and it’s not unusual for that concern to become worry and often times panic because of the daily news stories of horrific acts and tragic events. They can make you want to keep your children inside with the doors locked, never letting anyone else near your kids. However sheltering your children from any and all life events in the name of safety isn’t necessary or practical. This extreme worry can greatly affect the child, causing fear, stranger anxiety and social problems for the child. There is, however, a way to balance the worry parents have for the safety of their child with the positive social development of that child. Some children are outgoing by nature and some are reserved and shy. It is easy to see when a child is on the extreme ends of this temperament spectrum, but it is more difficult to see when a child is somewhere close to the middle. It is important for parents and caregivers to be sensitive to their child’s emotions and reactions to strangers, as well as to be cautious of their own reactions around unfamiliar people. It is very easy for parents to over react when their child falls or gets hurt. Instead of always instantly running to the child’s side when she falls or bumps something, parents should wait and observe what her reaction to the accident is. Often times when a child falls it takes her a minute to figure out for herself how she feels about the situation. Waiting for her reaction will help her to evaluate her own pain instead of relying on your assumptions about her pain or fear. When and if she determines that she is hurt physically or emotionally from the accident, parents should help the children work out those hurts with hugs, kisses and words of love. Parents that are overly afraid of strangers often transfer these fears to their children. If a child is scolded every time she reaches out of her comfort zone to talk to someone new because her parents are anxious about what might happen, the child is going to become terrified of anyone she does not know. When this happens that fear can transfer to her teachers and even other children. Instead of reprimanding a child for being social, teach her to embrace the social skills needed to meet new people without mistaking that person for a trusted friend. Encourage her to talk to people that she does not know, but remind her that she should always have her caregiver’s permission before she goes anywhere with anyone. Remind her to never accept gifts from people unless she has asked the adult in charge if it is ok. Explain that if she is ever uncomfortable for any reason she needs to tell someone she trusts. Children have a sense for when they are uncomfortable in a situation. Often times when a child suddenly becomes shy around another person, parents can become embarrassed that the child is not responding in the expected way. The parent may then begin to push and convince their child to answer the question or be more social. However, the child is simply being shy because she wants to assess the new person for herself. This is a habit that parents should welcome and encourage because it means that when the parent is not around, the child still has a discerning mind that will help her to judge who she should trust and who she should not trust. When parents push a child into acting toward a new or unfamiliar person in a way that the child is uncomfortable with, parents are teaching that child to not trust her own instincts. Parents want to protect their child from unwarranted emotional pain. They often worry that sharing details of an event will cause the child to fixate on the situation or have bad dreams. There is a part of this that is true, and for some hyper sensitive children giving negative details can cause nightmares and obsession. However, a child is usually sensitive to her parent’s emotions. If there is something that is bothering her parents, she will often overhear things that concern her. Even if she never hears a word spoken, she can still feel the stress in the home. When parents avoid sharing the reason they are upset, the child is likely to worry about it more, and she may even think there is something that she has done wrong. All these mixed emotions and confusion may cause her to react with negativity and display needy behaviors. It is a much better option to open up and share with the child the reason the parent is concerned without giving too many confusing and scary details. Keep it simple and let the child know that you are worried, but that it is ok to be a little worried about things. Whatever happens, she will always be loved and cared for. The world can be a very scary place. Children, especially children with a timid temperament, need help navigating the ups and downs of life. They need help finding balance between caution and fun, fear and excitement, sensitivity and eagerness. Parents and caregivers need to help children find that balance without stifling the creativity and social skills needed to live a healthy and successful life. Autism is a developmental disorder that first becomes apparent in early childhood and will affect every aspect of a child’s development. 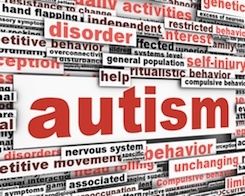 The autism spectrum is a range of neurodevelopment disorders that present themselves through repetitive behavior patterns, difficulty communicating and social impairments. Kids who have autism can fall anywhere along the autism spectrum, and those with more manageable symptoms are usually classified as “high functioning.” Parents of children with autism who are in need of support were once somewhat restricted in their ability to reach other parents with children on the spectrum, but the interactive global community created by the Internet and a legion of bloggers has helped to change that. These 30 blog entries can help you find the information you’re looking for, and can also lead you to your own online support system, which will be important as your child grows. Because children often begin exhibiting symptoms of autism in late infancy, but do not obtain a diagnosis until toddlerhood or later, their parents can greet an official diagnosis with feelings ranging from relief to anger and despair. These five blog entries tackle the difficult subject of coping with your child’s autism diagnosis so that you can move forward and be proactive about his treatment. My child’s Been Diagnosed as Having Autism – What Do I Do Now? And the Diagnosis Is… Autism! The autism spectrum includes developmental disorders like Asperger’s syndrome, classical ASD, childhood disintegrative disorder and pervasive developmental disorder not otherwise specified, or PDD-NOS. These five blog entries discuss what the autism spectrum is in greater depth, and can help you understand more about what’s happening to your child from a developmental standpoint. Is Autism an “Epidemic” or Are We Just Noticing More People Who Have It? Because the causes of autism spectrum disorders aren’t fully understood, there are theories blaming everything from standard childhood vaccines to dietary choices. These five blog entries discuss some of those theories and make for interesting reading. However, parents are cautioned to keep in mind that these theories are just that, and should not take the place of information provided by your child’s doctor. What’s the Real Cause of Autism? Because diagnoses on the autism spectrum are becoming more common, most public schools do have a basic understanding of children’s needs and development. These five blogs are still great resources for parents who are hesitant to send their child to school, and can help to arm you with the information you need to act as an advocate for him. Entrusting your child to a new caregiver can be particularly nerve-wracking, but these five blogs are filled with information that you can pass along to them. These five posts are full of recommended reading for parents and childcare providers of children with autism. One of the biggest challenges that parents of children with autism face is learning to communicate with a child that may have difficulty doing so or is downright unresponsive. These five blog entries discuss the various methods of communicating with your child and the stumbling blocks along the way. Autism: How Do You Communicate With a Non-Verbal Child? While working as a nanny may seem like child’s play, there is a business side to nannying that cannot be overlooked. Like with any other job opportunity, when considering employment as a nanny it’s vital to assess job risks and liabilities. Many nannies, especially those who are new to the profession, are shocked to discover that, in general, nannies do not carry liability insurance. Since nannies work in a private home, unsupervised, the risk of being accused of abuse, neglect, mistreatment or worse is real. Unfortunately, since nannies do not have professional licenses like – for example – teachers do, securing liability insurance is hard, if not impossible. Occasionally an insurance company will crop up and advertise that they are offering liability insurance for nannies, but then, after careful assessment of the risks, the policies are discontinued or the premiums become too outrageous for a nanny to afford. Even if liability insurance was readily obtainable, the reality is that it does not protect a nanny from being sued, but it certainly could help defray the cost of litigation. Just as nannies are surprised to learn that liability insurance isn’t a common thing in the nanny community, they’re just as surprised to learn that having employer provided health insurance is. Over 25% of full-time nannies receive partial or full contributions towards their health insurance premiums, according to the International Nanny Association’s 2012 Nanny Salary and Benefits Survey. While some nannies do not need employer provided insurance because they are still covered by their parents’ plan or are covered through a spouse, for many nannies health insurance coverage is a real need. This is especially true in states like Massachusetts, where having health insurance is mandatory and the failure to have it is punishable by a fine. Eisenberg Associates, www.eisenbergassociates.com, has specialized in helping nannies and families find appropriate health insurance coverage since the 1970s. Many nannies fail to recognize that if they will be transporting the children in their own vehicle, they may not be covered if an accident occurs. Nannies must consult their insurance agent to determine if their policy extends coverage to using their vehicle for work related use. If it doesn’t, the nanny may have to adjust her policy and pay a higher premium. If the nanny will be using the employer’s vehicle, she should confirm that she is listed as an insured driver and that the family’s coverage extends to her. Is some states, employers are required to carry Workman’s Compensation Insurance, but in other states carrying it is optional. Workman’s Compensation policies extend coverage to nannies who are injured or become ill while on the job. If you fell and broke your leg while at work, your employer’s homeowner’s insurance policy may not extend coverage, since you are an employee and not a guest. When conducting your job search, inquire as to if your employer will purchase Workman’s Compensation Insurance. It can be a benefit for an employer to do so because in some states employees who have coverage waive their right to sue for pain and suffering. Say you get pregnant and are unable to work, or that you are injured while off the job. Disability Insurance extends financial benefits to employees who are unable to work due to a non work related injury or illness. 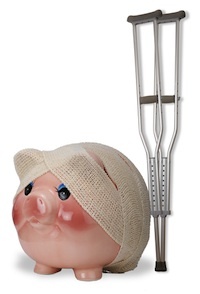 In some states, having disability insurance is optional, and in others it is required. Regardless, it’s fairly inexpensive and can be purchased by either an employee or an employer. Having disability insurance can also benefit families. If a nanny is hurt, their employer may still need childcare, but may not be able to afford paying both you and a replacement. With disability insurance, your employer may be able to bring in a temporary placement because a percentage of your salary is being paid through insurance. While insurance may not be a deciding factor in perusing a career as a nanny, it’s important to consider the risk climate of the career you are considering. While you purchase insurance with the hopes that you don’t need it, having it just in case can certainly bring peace of mind. Parents may have great intentions of getting their children involved in chores around the house, but life can frequently get in the way of even the best of intentions. Here are a few simple things you can quickly teach your children to do around the house to foster their involvement. Set the table. Getting the plates, cups and silverware out is a great way to not only get your child to help out around the house, but also to be invested in family meals at an early age. You can utilize one of the lower cabinets in your kitchen for the plates and cups that you use for normal everyday meals so that your child will be able to have easy access to them at mealtime. Clear the table. Taking the dirty dishes to the sink area is a very simple task, and one that is important to get your child in the habit of doing. As he gets used to this, you can teach him how to scrape off all the leftover food into the trash before placing it next to the sink. Wipe off the counters and table. Wiping the counters is typically a favorite of a child’s first “jobs” because it is simple and fun. For some reason, kids love the idea of cleaning off the gunk and making the table shiny – almost as much parents like to have clean tables and counters. Put clothes in the washing machine. Laundry time is often a chore for moms and dads. You can help your child begin to learn to do her own laundry by getting her to help out early on. It should be very simple to have your child put the clothes in the washing machine if, as you sort them, you put the first load on the floor next to the washing machine. If you have a top loading machine that she cannot reach, you can get a small stool for her to stand on, but if you have a front loading machine it is that much easier. Sort socks. This is a great way to help your child develop matching skills, which is a very important beginning math skill to acquire. Lay all the socks out on the floor and let him find the “pairs.” You may need to help with some of the socks that look “similar,” but if corrected in a gentle way he will pick up on this quickly. You can even encourage him to look for the socks with holes in them. Feed the pets. If you child gets a great amount of joy from her pets, she should learn from an early age that the pets need to have their needs met. The most basic of these needs is food and water. Keep your pet food in an accessible place to make it easier for your child to feed the pet. To ensure the animal gets the right amount, keep a serving cup that holds just the right amount near the food. 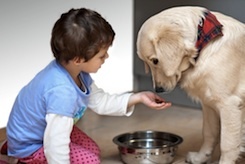 You can develop a chart that your child can check off when the animal is fed to help her understand that the animal needs to be given food at certain times during the day. Put his toys away. This should be a no brainer, but it is often far easier to pick up a child’s toys at the end of the day than to coax him to do it. However, it is worth the trouble to teach the valuable life lesson that if our things are important to us, we need to take care of them. Take garbage out of the car. It is so much easier to keep a car clean when it is child-free because you simply take everything into the house at the end of a car ride. But add children to the mix, and sometimes multiple children, along with all their garbage, toys, backpacks, and who knows what else and you will have a much harder time keeping the car clean. Building the habit of keeping the car clean with children is not easy, but it can be done. Try keeping a few small canvas shopping bags in the car. Then every time you have a lot of stuff to bring in you can have your child put it all in the canvas bag and carry it in herself. Get the mail. Kids love mail, even if it is not all for them. With younger kids you can do this task together. To ensure that your important mail always gets to you, have a designated spot that your child can reach and teach him to place the mail there. Pull weeds. Finding tasks for your toddler to do in the yard can be hard, but pulling weeds is one that little hands are capable of doing. If you get him a pair of small gardening gloves to protect his hands and teach him what the weeds look like, you will find that pulling weeds may be one of his favorite things to do with mom or dad outside. Your child’s mastery of each task will come over time. While it can be tempting to focus on perfect execution, instead focus on the important lessons you’re instilling in your child as you encourage him to take an active role in helping out around the house. The rich history and desert beauty of Tucson and the nearby Sonoran desert makes it an interesting and diverse place to visit, and a surprisingly great choice as a family vacation destination. In addition to the many annual cultural events and fairs that take place around the city throughout the year, there are also a variety of kid-friendly and family-themed attractions in the area. These are ten of the best things to do with your kids in the Tucson area, each of which makes a strong argument for choosing Tucson for your next family vacation. 390th Memorial Museum Foundation (Tucson, AZ 85756) – More than 10,000 photographs, 90,000 pages of combat history and the collected oral histories of 100 World War II veterans take center stage at the 390th Memorial Museum Foundation, which celebrates the 390th Bomb Group. Responsible for cutting supply lines to the Germans during the Battle of the Bulge, among other heroic feats. Abraham Lincoln Regional Park (Tucson, AZ 85730) – Sprawling over 191 acres, the Abraham Lincoln Regional Park features a four-field softball complex complete with a concession stand, a swimming pool, playgrounds, volleyball courts and a walking path. The Attrubury Bird and Animal Sanctuary is also located on the premises, ensuring that there’s something to entertain every member of your family. Arizona State Museum (Tucson, AZ 85721) – The history and rich culture of Arizona, the entire American Southwest and northern Mexico are celebrated at the Arizona State Museum, which is both the oldest and the largest anthropological museum in the region. Boasting the largest collection of Southwest American Indian Pottery in the world, the ASM is also affiliated with the Smithsonian Institution. Colossal Cave Mountain Park (Vail, AZ 85641) – This 2,000-acre park is on the National Historic Register, with the La Posta Quemada Ranch and crystal-filled caverns on the premises. Museums, trail rides and cave tours are offered daily, and picnicking is permitted on park grounds. Gadsden-Pacific Division Toy Train Operating Museum, Ltd. (Tucson, AZ 85754) – There’s something about toy trains that inspire unbridled joy in some kids. If there’s a model train aficionado in your family, you simply can’t pass up a visit to the 6,000-square-foot Gadsden-Pacific. Upwards of fifteen loops of track with a variety of trains running, railroad memorabilia and a rug system complete with wooden trains for the very small set are among the attractions, along with the full-sized caboose and real switch controllers. Kitt Peak National Observatory (Tucson, AZ 85726) – Perched above the Sonoran Desert is the Kitt Peak Natural Observatory, which makes it easy for kids and adults alike to explore the universe, thanks to the world’s largest collection of optical telescopes. Tours are of either the docent-lead or self-guided varieties, with nightly stargazing in the Visitor Center Public Telescopes available through advance reservations. Children’s Museum Tucson (Tucson, AZ 85701) – Play-based, interactive learning is the name of the game at Children’s Museum Tucson, which sprawls over more than 11,000 square feet packed with hands-on activities and exhibits. Adults are encouraged to participate, meaning you won’t be reduced to supervisor duty during the visit. Arizona-Sonora Desert Museum (Tucson, AZ 85743) – With a renowned zoo, botanical gardens and a natural history museum on-site, the Arizona-Sonora Desert Museum is actually an interactive, educational complex. More than 1,200 types of plant and 300 animal species call the site home, easily explored via two miles of walking paths. Biosphere 2 – University of Arizona, Tucson (Oracle, AZ 85623) – An hour north-east of Tucson, the University of Arizona, Tucson-sponsored Biosphere 2 lies. The living laboratory is a glass-enclosed structure that boasts three separate habitats, including a Savannah and a Rainforest. Old Tucson Studios (Tucson, AZ 85735) – Train rides, a simulacrum of an Old West schoolhouse and a small selection of rides aimed at the smaller set make Old Tucson Studios an exciting destination for kids. Adults with an affection for old Western films may also get a kick out of touring the attraction, as a number of the golden-age films were shot at Old Tucson Studios. Annual nanny reviews do more than give nanny employers an opportunity to give their nanny a raise; they provide a much needed opportunity to evaluate the health of the working relationship. Each year, parents should schedule a time to meet with their nanny and hold a formal year-end review. The review should provide both verbal and written feedback and should end with updating the nanny and employer work agreement, should both parties wish to continue their working relationship. 1. Annual reviews provide a forum for employers to give their nanny valued feedback. When you see a good friend every day, it’s hard to notice if she’s gained or lost a few pounds. But when you stop and consciously consider her appearance, or compare older photos to new ones, you’ll more than likely notice any change. The same is true with nannies and employers. Life is so busy and the handoff of children happens so quickly, parents don’t always take the time to stop and reflect on how their nanny is doing with things both big and small. An annual review forces parents to take inventory of their nanny’s performance and to provide feedback, both good and bad. 2. 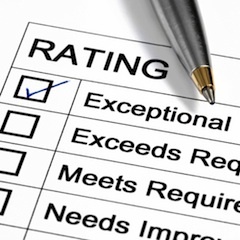 Annual reviews provide an opportunity to develop a game plan. As children grow older their needs change. Babies become toddlers, toddlers become preschoolers, preschoolers become elementary school students and as such, their needs and the rules for providing for those needs may change. An annual review provides an opportunity for parents and nannies to discuss upcoming developmental milestones and impending life changes, and develop a game plan for handling them. 3. Annual reviews set the stage for reassessing and regrouping. From tackling potty training to communicating with each other, sometimes nannies and parents feel like they’re surviving, rather than thriving. They’re doing what it takes to get by and they’re well aware that change needs to occur, but they haven’t had the time or energy to sit down, reassess and regroup. An annual review sets the stage for talking about what’s working and what’s not, and provides an opportunity to get everyone back on the same page. 4. Annual reviews open the door to ending the working relationship. While nannies and parents may fantasize about being together forever, children eventually outgrow the need for a nanny. While it’s sad to have a conversation about ending the working relationship before that time comes, the annual review is a perfect opportunity for parents to outline their long-term care plans and for nannies to outline their employment plans. While it’s unrealistic for parents to commit to their nanny for several years, they can let the nanny know that it’s their desire and plan, barring any major life changes, to continue employing a nanny until their youngest child starts kindergarten, for example. As such, nannies can let the parents know that they envision staying with the family as long as they’re needed or that they plan on moving on once the children reach a certain age. Most nannies and parents who have a healthy relationship prefer to devise an end plan together. Keeping the conversation on the table allows them to do just that. 5. It allows for renegotiation. Perhaps your nanny’s responsibilities are changing but you haven’t had a chance to update her work agreement or adjust her compensation. Maybe your nanny would like you to consider a new employment benefit, like paid professional days off and her International Nanny Association conference registration fee paid for, but hasn’t had the opportunity to ask. Each year parents and nannies should revisit their written work agreement and be sure it is current. Written addendums should be made, if necessary, to reflect an increase in compensation or a change in duties or responsibilities. An updated agreement or an addendum that allows for the continuation of the agreement should be signed by both the nanny and parents. For nanny and employer relationships to succeed, open and honest communication is essential. In addition to an annual review, nannies and parents should schedule time to meet on a regular basis, either monthly or weekly, and should make it a point to have a brief check-in chat either at the beginning, during or at the end of each day. Thanksgiving is here and with it the holidays have begun. Since the season starts with a day we are meant to reflect and be thankful for what we have, most parents have great hope that the whole season will remain peaceful and pleasant. This is of course rarely the case. A lot of children have already begun scoping out the toy catalogs and circling everything they want however, you can instill gratitude in your child in the midst of the holiday experience. Focus on spending time with family over the holidays. There is a gift that cannot be purchased and believe it or not it is a gift that children want more than any toy. The holidays are too often hurried and chaotic. Though parents often have more time off work around the holidays, they often spend less of it with their kids. True thankfulness can only be learned by witnessing someone who has it. 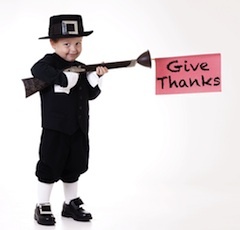 If parents want their child to be grateful, they need to connect one on one with each child and model a thankful spirit during this hectic time. Make a big deal of GIVING!!! 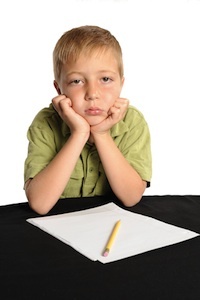 Children frequently make lists of everything they want to get as gifts. In order to build appreciation parents can work with their child to make a list of people to give gifts too. Younger children can make a simple gift for everyone on the list. This can be a great way to spend that extra quality time together. Older children do things around the house to earn extra money in order to buy gifts for the people they care about. This will help the child understand that all the “stuff” she gets as gifts has value. In addition it teaches that time, energy and money is often spent on people that you cared for. This will help the child understand that when her parents give her gifts, it is because she is loved and cared for. Find a way to teach children about other children who do not have as much. There are so many charities that offer opportunities to give to families less fortunate over the holidays. They can range from putting a box of toys together to actually inviting another family into your home. Parents need to choose what is right for their family but exposing a child to other children that do not have as many toys, games, books and media can be a great eye-opener. And actively making the holiday season happier for other children can make a child much more thankful for what he has. Here are a few websites to get you started. Give gifts to family and friends that have significant meaning. A lot of the time we rush around and pick out gifts for people just to give them something. This teaches children it is all about the gift instead of the thoughtfulness that goes into the gift. Be deliberate and specific about the gifts that are picked out and give to others. Say things like “I think Uncle Joe will love this fishing pole because he loves to fish so much” or “I am going to get Grandma Sue this shawl because she is always cold and she loves purple.” By explaining and clarifying why the gift is being given to the specific person parents put a reason behind the gift. Avoid giving children too many gifts. Parents often have almost as much fun buying gifts for their children as their children do opening them. In order to help children have a sense of satisfaction and appreciation, avoid overdoing it on gift giving. Focus on one or two gifts that have significant meaning to the child. Decide on a budget and then stick to it. Ask family members to respect this as well because it is very common for grandparents, aunts, uncles, etc. to go overboard too. If family really wants to shower a child with gifts, ask that the family member plan a fun outing with the child as a gift instead of an object. This once again focuses attention on people instead of things. It is possible for a young child to have a fantastic sense of thankfulness. Focus on doing things together and gifts that cannot be purchased during the holidays and you will be off to a great start. As one of America’s oldest cities, Boston is rife with historical and cultural importance, which makes it an ideal vacation destination for families who are hoping to intersperse their carefree fun with a bit of entertainment that also has educational merit. These 30 bloggers offer their opinions, advice and insight on everything from historical walking tours to the best places to eat with kids in the Boston area to the best playgrounds for active, outdoor play. 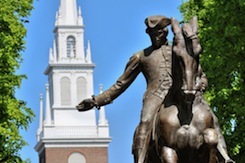 Helping your kids to understand the origins of America and the important role that the city of Boston played in the American Revolution is one of the most entertaining and educational things that you can do while visiting the city. These five bloggers share their own experiences with historical events, tours and sightseeing opportunities in and around Boston. While education is an important part of many family’s vacation plans, it’s also necessary to let kids cut loose at a facility designed with them in mind. The bloggers on this list discuss their favorite attractions in Boston for kids, offering reviews and hints for ensuring that a great time is had by all. Keeping kids healthy and in good physical shape requires that they have plenty of time to engage in active play. When the weather’s nice, a quality park or playground is often the most ideal spot for encouraging both physically active and imaginative play, which is why these five bloggers weigh in on the best outdoor, kid-friendly facilities that Boston has to offer. Aside from the traditional walking tours of sites with historical significance, Boston is also awash in museums and education centers that keep kids engaged and entertained while they learn. The experiences, opinions and hints set forth by these five bloggers can help you build your travel itinerary confidently. The strong culinary culture in Boston is great for adults, but may not always be as welcoming to children. The most kid-friendly eateries in the city are discussed at length in these five blog entries, ensuring that you’ll have a plentiful list of meal options before you ever arrive in Boston. Depending on the time of year when you plan to visit, there could be a variety of seasonal or special events happening within the Boston area. These five blogs help you keep track of what’s upcoming in Boston so that you are able to plan your trip accordingly. As the capital of Ohio and the largest city in the state, Columbus was named the best place in the country to raise a family by Newsweek in 2009. For parents whose plans run more along the lines of visiting Columbus than moving there permanently, taking advantage of the ample collection of kid-friendly activities in the city can make for a great family vacation. Here are ten of the best attractions for kids that Columbus has to offer, which make up only a small selection of the many available options. COSI Columbus (Columbus, OH 43251) – The COSI hosts an array of traveling exhibits, alongside their renowned permanent installations. The kid-friendly attractions include a Kidspace for little ones. a Big Science Park that teaches kids to lift a car off the ground using scientific principles and allows them to ride a Centripetal Generator. Don’t miss the only high-wire unicycle installation in the country, which older kids are welcomed to ride. Ohio Historical Society (Columbus, OH 43211) – The Ohio Historical Society network spans the entire state, with the headquarters in Columbus hosting a museum and several historically-themed attractions on the grounds. The highlight of the complex is the Ohio Village, a fully recreated Ohio town from the nineteenth century, complete with costumed interpreters and several authentic buildings. Columbus Zoo, Aquarium and Zoombezi Bay (Powell, OH 43065) – Combining the kid-pleasing charms of a zoo, water park and playground makes the Columbus Zoo, Aquarium and Zoobmezi Bay a safe bet for parents looking to keep their kids entertained for an entire day. The pachyderm building on site is also the largest in the world, and is open year-round. Fifteen water slides, a lazy river and wave pool make up the water park section, which also includes a shallow area for little ones. Slate Run & Slate Run Living Historical Farm (Canal Winchester, OH 43110) – One of the best ways for kids to learn about history is to observe it in action, an opportunity afforded by the Slate Run Living Historical Farm. Helping with chores on the working 1880′s era farm give kids an accurate picture of life during that time period, while the thirteen miles of trails are a delight for fans of hiking. There’s also a campground space that families can reserve through the park offices, a sure-fire hit for outdoors enthusiasts. Franklin Park Conservatory (Columbus, OH 43203) – More than seventy-three thousand square feet of greenhouses and classrooms call the ninety-acre Franklin Park Conservatory home, including a Victorian glass house. Waterfalls, unique gardens, collections of exotic plants and educational programs are among the offerings at Franklin park, as well as several summer programs directed solely at kids. Ohio Railway Museum (Columbus, OH 43085) – One of the oldest railroad museums in the nation, The Ohio Railway Museum boasts the Ohio Public Service Interurban Car #21, which is listed on the National Register of Historic Places. Kids with an affection for trains are sure to be in heaven with the exhibits and rides on streetcars or a classic Pullman passenger. The Kelton House Museum & Garden (Columbus, OH 43215) – Special tours led by historical reenactors celebrate the significance of Kelton House during the time of the Underground Railroad, while meticulously manicured gardens reflect the Victorian theme of the home beautifully. Tours and teas are available to visitors, with many special events held on-premises throughout the year. German Village (Columbus, OH 43215) – Listed on the National Register of Historic Places, German Village is a short jaunt from downtown Columbus. The brick streets, lovingly maintained homes and diverse selection of shopping, dining and park options make this quaint four-mile area a favorite with Columbus residents and visitors alike. The Works (Newark, OH 43058) – Whether the tastes in your family run towards visual art, exploring scientific concepts through interactive learning or simply enjoying the peace of a beautifully-maintained courtyard, there’s something for each of you at The Works. Visitors of all ages and abilities are invited to experience the engaging exhibits and installations, making sure that everyone in the family has a great time. Santa Maria (Columbus, OH 43215) – Give kids an up close and personal view of American history with a visit to this impressive replica of the famed Santa Maria, part of the fleet that carried Christopher Columbus on his fateful journey. The forty-five minute tour includes interaction with navigational tools, but there’s also a special children’s tour available. If the timing of your trip coincides with the arrival of the Ohio State Fair, be sure to take the chance to experience one of the largest state fairs in the nation. Columbus plays host to a surprising number of festivals and special events throughout the year, so be sure that you check local listings in the weeks leading up to your trip to get the most out of your visit.